Facebook's new GDPR-compliance features allows you to block all ads related to your website visits. This article relates to features specific of Facebook, a third party website; it is provided for your as a reference. 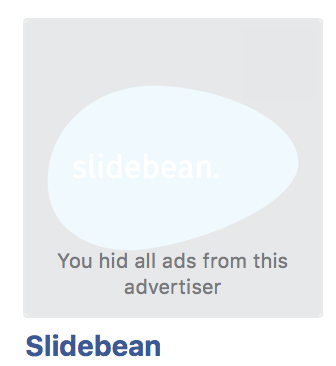 If you would like to stop seeing Slidebean ads on Facebook, you can use the Ad Preferences section to see what interests Facebook has tracked about you, and edit/remove the ones you no longer want to see. Go to 'Advertisers you've interacted with'. Select the 'Whose website you've visited' Tab. If you see Slidebean on the list, click the Remove button that shows up as you hover over the logo. That's it! All ads served by us will now be blocked for you.